The Incredible Adventures of Van Helsing I will soon be available on PlayStation 4 and will take full advantage of PlayStation 4 Pro's more advanced hardware! 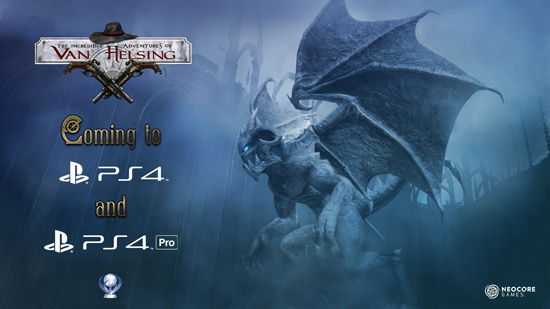 The PlayStation 4 version of The Incredible Adventures of Van Helsing will be our debut on Sony's amazing console, introducing the players to a brand new Action-RPG experience. The port of our award-winning game will come with full DualShock 4 support, high-res graphics and of course, a Platinum Trophy. More than that, the PlayStation 4 Pro version of The Incredible Adventures of Van Helsing will run in significantly higher resolution and with an even smoother frame rate. More details to come soon. The Incredible Adventures of Van Helsing is an Action-RPG set in a gothic-steampunk world filled with monsters, weird science, humor and pop-cultural references.